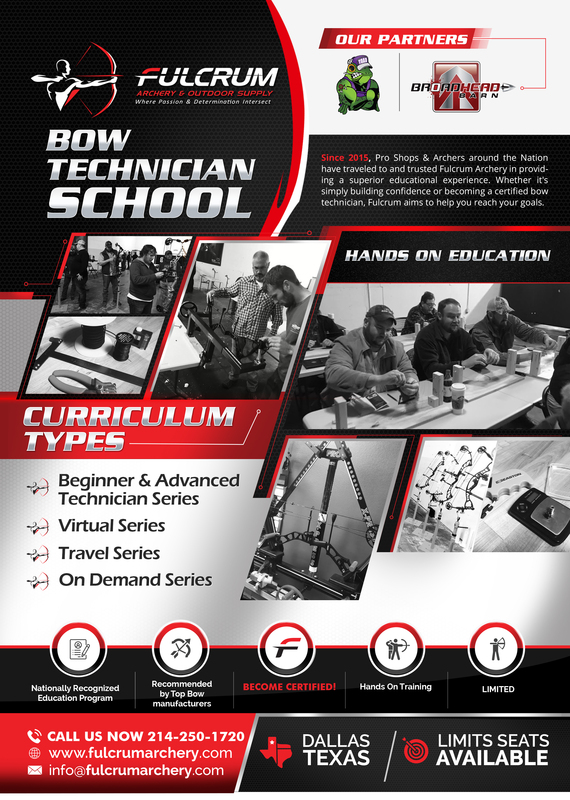 Fulcrum Archery is proud to present to you the Fulcrum Shooter Technician School. Our school teaches you the knowledge and skills that are needed to work in a professional archery shop by providing hands on training using all the latest technology. We will teach you cutting edge tuning techniques that many of the top archers in the world use today. Our School utilizes a hybrid teaching methodology that consists of both lecture and a corresponding lab session. You actually perform all activities through a series of hands on exercises that teach everything from A-Z about maintaining, tuning, and optimizing bow performance. This series is not just a lecture! Come in and rotate from work station to work station as you master each technique of bow setup & tuning. By the end of the 2nd day, students can expect to fully disassemble, reassemble, setup, and tune a modern compound bow. Upon successful completion of the class, we offer an optional certification test. Upon passing you will receive a Certificate declaring you a Certified Fulcrum Bow Technician. This certificate is suitable for framing and will look great displayed for everyone to see in your shop. Please call us today for full details. We'd love to talk with you. Additionally, we can provide you with a list of references that you can contact who have recently completed our Technical Certification School. Our classes generally fill up quickly and sell out. Sign up early or in the case of a sell out, contact us today to be put on the wait list.